I was going to a press screening for Terminator 2 in 3D, got to watch this one before that. Very different movie. But there is a link with superheroes, it’s directed by Mark Webb who did the Andrew Garfield Spiderman movies…thin, I know. And from the looks of it I expected one of those romantic, dare I say it and yes I dare, girl/women flicks. Instead I got a very nice film I really liked, with romantic ‘stuff’ but more than only that. 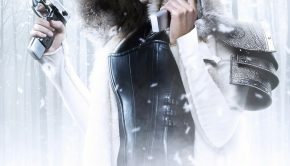 And it’s no punishment to look at Kate Beckinsale (fits the bill for a page like comics for sinners 😉 ) as she’s an incredibly beautiful woman in my opinion, so bring it on. And as I hardly had any knowledge of this movie I was surprised to see Jeff Bridges turn up in it. The movie starts with a narrative about New York, how it changed, etc. We get introduced to Thomas Webb, an early 20’s guy out of school and not exactly sure where to go with his life, with rich parents and a father who’s not satisfied with his son aspiring to be a writer. Then there’s Mimi as his friend. Yup, friend, not girlfriend….Thomas got friendzoned, ouch. She has a boyfriend who’s not nearby. You can guess, Thomas wants to be more than friends. Then Mimi drops a bomb by telling she wants to move to Croatia, with Thomas getting mad. Thomas goes home and finds a scruffy-looking man sitting on the appartment stairs, new neighbour from 2B. Thomas looks upset and says he’s having a bad day, to which the neighbour replies ‘What’s her name?’. That neighbour is played by Jeff Bridges and he’s perfect in his role, I liked his performance, his face, what a guy! The two become friends and the alcoholic neighbour is always a listening ear with advice to give. Soon Thomas finds out his father has an affair, with the beautiful Johanna (more than beautiful actually, I really really like Kate Beckinsale, sue me). He starts following her and then things get complicated as the son eventually sleeps with his father’s mistress. This leads to a few uncomfortable moments later on and things boil up to the moment Thomas has to come clean with it all and confront his father. Now all this sounds very cliche and of course it is to a certain point. But the acting is really good, the lead Callum Turner delivers a solid performance (his face reminded me of a young James Franco at times), as does the rest of the cast, with Bridges really standing out, the man just has this undeniable screen presence as most people would agree. The scenes with Bridges and Turner together are great. So cliche elements but lovely delivered without getting mushy in a negative way. In the end all is neatly wrapped up but that didn’t bother me at all to be honest. And when I said things get complicated I didn’t give it all away, there’s more…..
Lovely movie, a slow pace without getting boring, a coming of age movie but also very much a possible true depiction of a family with secrets, as they exist in real life too….perfect on the outside but on closer look…. The movie gets its title from the same named Simon and Garfunkel song. Remember another song from that duo, about a Mrs. Robinson? Exactly, from The Graduate! And the movies can be compared too with the Graduate as absolute classic and The only living boy in New York not achieving that status, but still a very good movie on its own. Of course this song and title are deliberately chosen as the makers knew fully well they borrowed from The Graduate, but that’s ok really. I enjoyed this way more than I expected to. Take your better half and go see it…..no other half, then see it anyway, it really is a nice movie.